How can I supplement my diet to remedy constipation the natural way? Just by doing these simple floor exercises and adjusting your diet can you be sitting pretty worry-free. Here how easy it could be. Japanese women aren't invincible against the pain the constipation brings to your daily life. The slowing down of you bowel movements causes your intestines to swell up having an adverse effect on your health. The result is your stomach sticking out leaving only bloated feelings behind as you worry about how you are going to deal with the problem. What can I do about constipation to improve the condition of my body? This bulge in your stomach is different than the fat you shed while dieting. However, that doesn't mean you can exercise and eat healthy to make it go away. In fact, there are ways you can send constipation away fast and easy with very little effort. People who need to go on a diet and people who are often constipated are in the same boat. One reason why many people suffer from constipation is that they lack exercise. When your stomach muscles are weak your body can't send food through your bowels as swiftly, or not at all, hence the symptoms of constipation. In Japan, natural remedies to constipation are appreciated which leads us to the discussion to be presented in this article, how to treat constipation with exercise and a healthy diet. A diet method that isn't recommended is reducing the amount of meals you eat without making up for it in the meals you actually eat. This is just like asking for your body to get constipated! Skipping a meal is said to cause the nutrient absorption rate in your bowels to decrease. This causes fewer nutrients to be picked up by your body and more fat to be absorbed instead, leaving solids to build up in your intestines. That's constipation in a nutshell. Telling people, "I'm on a diet," passing up meals is only asking for more problems. This sort of behavior is what causes you to gain weight, not to mention get constipate. In order to avoid this vicious cycle, it's important that you don't make excuses using your diet and eat at bare minimum 3 meals a day. The first step to fixing constipation is exercise, then comes eating foods to improve your condition, reliving constipation. For pregnant women not able to push their bodies as much as they used to, and people lacking exercise because of sitting at the desk all day are said to be develop constipation easier than most. That why in this episode of Slism, we will introduce exercises and healthy foods that can help rid constipation from your body. In order to treat constipation by exercising, you need to train the muscles around your stomach, i.e. your abs that work to make your intestines function better, producing smoother bowel movements. Although strength training would work the same way; but we all know how hard that would be. With that said, let's start out with some light exercise to ease constipation away. Start from a position lying on the floor similarly to the way you would do flutter kicks while swimming. Extend your legs outward and flutter your legs up and down without losing balance. Next, slightly bend at your knees performing the same flutter kick movements again. Do each portion of the exercise 10 times each. It's easier than you think. Don't worry you won't sink. Lay flat on the floor facing upward. Straighten your legs and raise your feet at least 1 foot off the floor and hold that position for a period of 10 seconds. Repeat doing 3 full sets. Hand position is key! Lay on the floor making an L shaped with your legs. Raise your arms above your chest. Slowly exhaling, tilt your body up to the sitting position. Returning back to a laying position, repeat 5 times. The exercises presented in this article, flutter kicks, leg lifts, and the L-shaped tilt, are best done in the morning right after waking up in bed everyday. Brief exercise right after getting out of bed not only helps you wake up; it also gives your abdominal muscles a nice clean stretch before you start your day. Exercise alone will only get you so far. As important as training your abdominal region is to changing your condition, it turns out that your diet matters a lot when trying to remedy constipation, after all the reason you get constipated is mostly about what you eat. Taking in enough dietary fiber, limiting the amount of dairy has been shown to improve the condition of your constipation. For ladies during their pregnancy, the amount of exercise that you can give your body is limited. 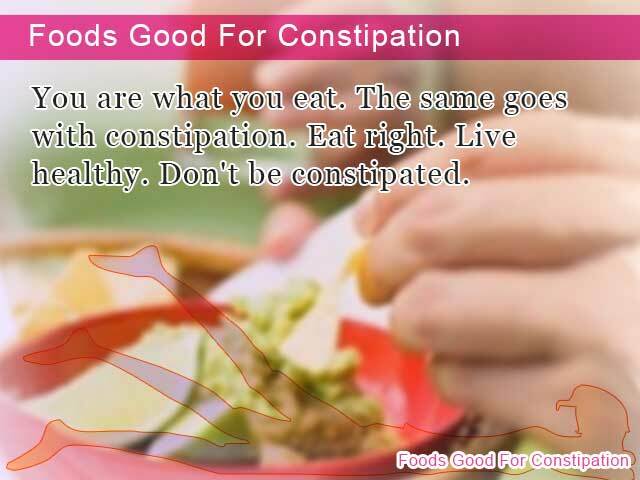 That is why incorporating foods to fight against constipation should be something you do while cooking. Whether you are looking for a way to spice up your salad or like to enjoy on of these delicacies with a teaspoon of salt, it turns out more to it than meets the eye. Avocadoes are a high-fiber food that can serve as a natural remedy to constipation in times when you need it most. Although I wouldn't recommend tiring up a box of Snickers to get your daily allowance of dietary fiber, the dietary fiber in just a handful of almonds can help you do just that. Even if you are not looking for a snack eating almonds is a fast and easy way to remedy constipation. Nobody can turn down a bag of raisins; but what we fail to realize while indulging is that raisins are an excellent source of dietary fiber that can make a difference in your bowel movements. Highly revered by dieter, this mineral is in fact effect in treating constipation. Although it may seem like satisfying your daily allowance of magnesium should prove a daunting task, mixing Magnesium Chloride with coffee and tea is a flavorful way get your daily magnesium. Note that consuming too much magnesium chloride can end with serious health risks so be advised and consult with a local physician before adding it to your diet. These simple sugars are not only low in calories and are friendlier to your blood sugar level, they also help increase the number of "good" bacterial found in your intestines. This process is said to help out with constipation. You may not be able to buy it at your local grocery store; however, there are many natural sources for Oligosaccharides such as soy bean products and bananas. Constipation doesn't only affect your stomach, the sure pain it brings can cause you to toss and turn in your bed at night. In the worst case scenario, there could be life threatening consequences to not treating the problem before it gets out of hand. In order to say goodbye to constipation for good, regular exercise and diet supplementation is recommended. Taking laxatives is a mess so start exercising in the morning and eating for your health and you'll be alright. A diet high in soluble dietary fiber may help you get full eating less. To get started why don’t you try out the psyllium diet? Say goodbye constipation. 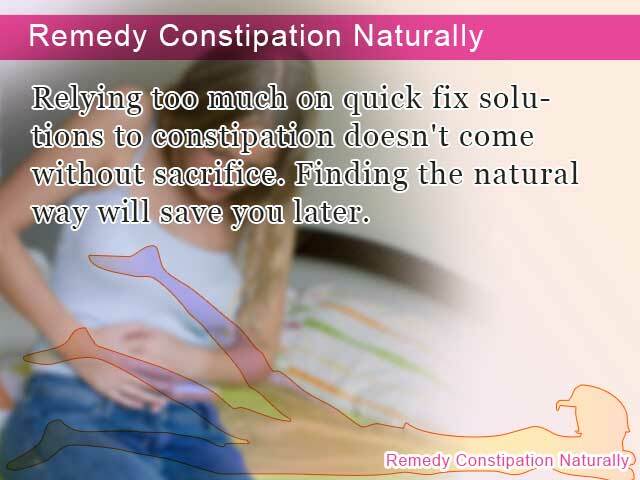 Relying too much on quick fix solutions to constipation doesn't come without sacrifice. Finding the natural way will save you later. Doing exercises on the floor is an excellent way to target constipation to ease your pain. You are what you eat. The same goes with constipation. Eat right. Live healthy. Don't be constipated.